We observe a strong interaction between the overlapping atom clouds in a dual- species magneto-optical trapping apparatus. 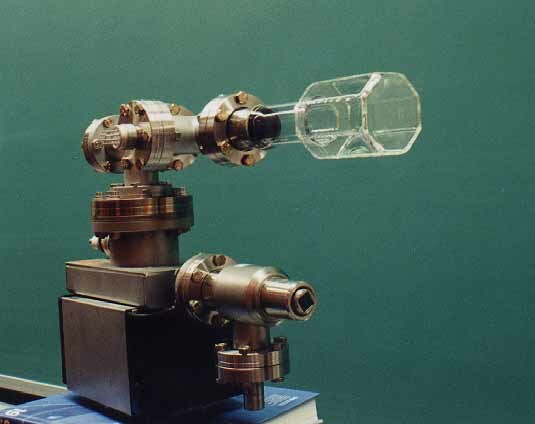 Our experiments utilize diode lasers for both Rb and Cs, creating the traps in a compact octagonal vapor cell. The number of trapped Cs atoms and the Cs trap filltime increase by as much as a factor of three when the Rb trap is turned off. 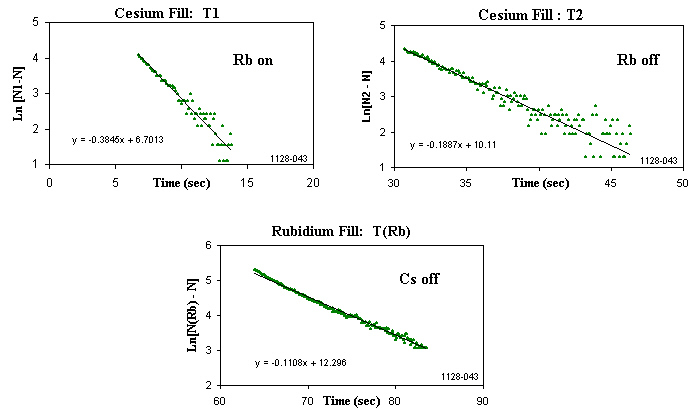 We present the results of experiments, for both rubidium isotopes, that investigate interspecies collisional loss rates at various trap laser detunings. The vapor cell is made from pyrex glass plates, fused together at the edges. The atomic vapors are generated by getters mounted in the sidearm of a conflat tee. The vapor pressure of each species is controlled by adjusting the current in the corresponding getter. Typical data is shown in the figure. 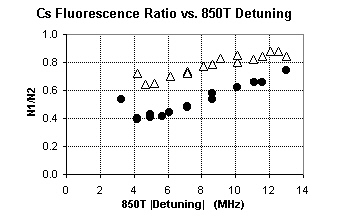 Cs and Rb fluorescence are shown as functions of time. 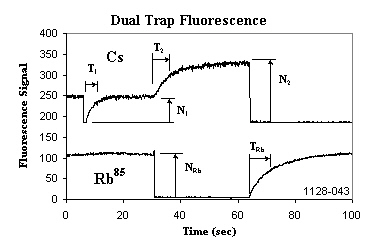 Initially, both traps are on, with Rb and Cs fluorescence levels N(Rb) and N1, respectively. At t ~ 5 s, the Cs trap laser is briefly blocked, after which the Cs trap refills to level N1. The Rb trap laser is blocked at t ~ 30s, allowing the Cs trap to fill to higher level N2. At t ~ 65s, the Cs trap laser is blocked and the Rb laser is unblocked, allowing the Rb trap to refill to its initial level, N(Rb). Logarithmic plots of the three fill curves are shown below. Filltimes T1, T2, and T(Rb) are determined from these. 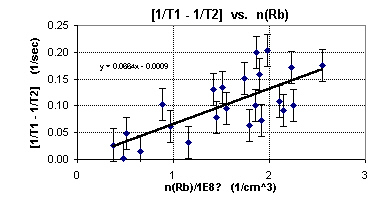 The corresponding data for the ratio T1/T2 is similar, but the scatter is greater. If it is assumed that the Cs trap fills at constant density but increasing size, the behaviors of N1/N2 and T1/T2 should be the same. The ratios N1/N2 and T1/T2 also depend on the detuning of the Cesium trap laser (850T). 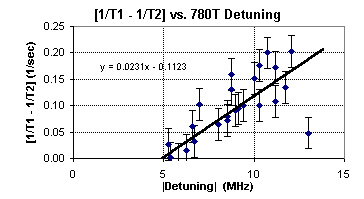 Smaller detuning results in greater Rb-induced Cs trap loss. 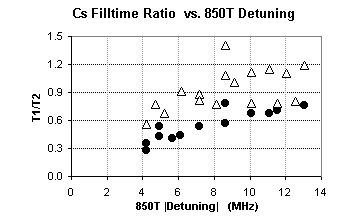 In short, the Rb trap has greatest influence on Cs trap loss when 850T has small detuning and 780T has large detuning. 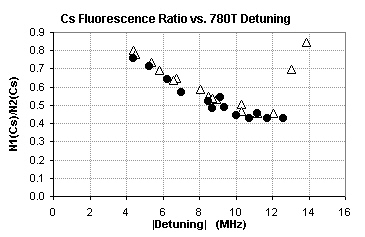 We have observed similar results in a Rb87-Cs dual species MOT. 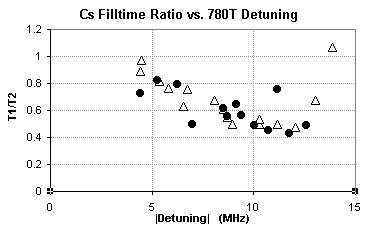 A plot [1/T1 - 1/T2] vs 780T detuning shows that the Cs loss rate due to Rb increases for 780T detunings greater than 5 MHz. When plotted against the calculated density of the Rb trap, this loss rate appears proportional to n(Rb). We need to reduce uncertainty in our measurements of trap parameters in order to determine the proportionality constant, betaprime, with confidence. The data here suggest a value of betaprime ~ 1E9 cc/sec. 1. The Cs trap was spherical, ~0.8mm diameter at half intensity points. 3. The magnetic field gradient was ~11 Gauss/cm. 4. Integrated trap laser intensities (six directions): 780T ~ 5mW, 850T ~ 3mW. 5. Integrated repump laser intensities (two directions): 780R ~ 2 mW, 850R ~ 1mW.